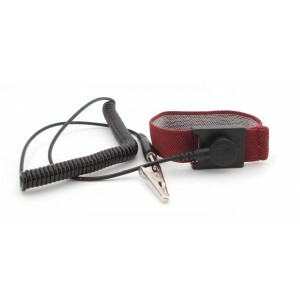 Constant contact hinge adjustable wrist strap set is available with a 6′ or 12’ standard coil cord design. They provide the performance and reliability of a metal band with the comfort of cloth. The blue knitted material has a soft outer area and a 5/8″ conductive area on the inside.Unlike many others which have 3-5 rows of conductive thread, these have a 5/8″ area of solid conductive material,the largest conductive area on the market. The constant contact hinge ensures continuity, reducing latent failures.